The brooch, which had been in the family of the Greek Dowager for a century , was confiscated at the New York Custom House and, according to Paris stories, Queen Olga is now trying to find some means of retrieving it. Anti-royalists in Greece assert that the whole Greek royal family, comprising the King and Queen, seven Princes and about thirty Princesses , are feeling the effect of the economic distress in Greece. Several weeks ago officials of the United States Customs Service in New York seized a lavalliere , with an emerald-studded pendant brooch, which they found in the possession of an electrician on board the steamship King Alexander. The jewel was appraised as having a value of more than $1,000, and it is still in possession of the government. The customs officers have disclaimed any knowledge of the history of the jewel or identity of its owner. The seizure was made on a charge of attempted smuggling. 2. 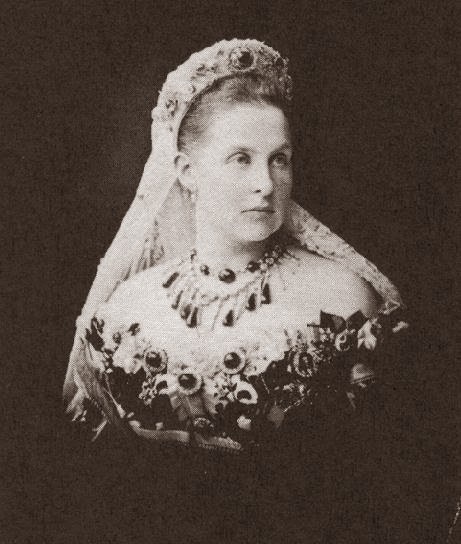 Olga Constantinovna of Russia (1851-1926) was queen of Greece from 1867 to 1913 following her marriage to King George I. She was born a Russian grand duchess, the daughter of Grand Duke Constantine Nikolayevich and the niece of Tsar Alexander II. She was the mother of one Greek king and the grandmother of three more; she's also the grandmother of Prince Philip, Duke of Edinburgh. 3. King Constantine I of Greece (1868-1923) reigned twice as the Greek monarch, first from 1913-17 and then again from 1920-22. Both of his reigns were marked by significant periods of upheaval in Greece; he abdicated twice. 4. Today, the former king and queen of Greece still possess a parure of emerald jewelry, inherited from Olga via her son, King Constantine I. The emeralds in those pieces also came from Olga's Romanov ancestors. It's unclear whether the piece described here included stones from the same cache of emeralds. Olga wears some of her emerald jewels in the photograph at the top of this post. 5. When this story was published, the Greek royal family included the following members: King Constantine I, Queen Sophie, Queen Olga, Crown Prince George, Crown Princess Elisabeth, Princess Alexander (Aspasia Manos), Princess Alexandra, Crown Princess Helen of Romania, Prince Paul, Princess Irene, Princess Katherine, Prince George, Princess George (Marie Bonaparte), Prince Peter, Princess Eugenie, Prince Nicholas, Princess Nicholas (Elena Vladimirovna), Princess Olga, Princess Elizabeth, Princess Marina, Grand Duchess Maria Georgievna of Russia (Princess Marie), Prince Andrew, Princess Andrew (Alice of Battenberg), Princess Margarita, Princess Theodora, Princess Cecilie, Princess Sophie, Prince Christopher, and Princess Christopher (Nancy Leeds). The royal family would gain an additional member -- Prince Philip, today the Duke of Edinburgh -- in a few weeks. The tally in the paper seems to be a bit off where princesses are concerned. 6. A "lavalliere" is another term for a jeweled pendant, often worn suspended from a chain.